The Body-Solid G6BR is a multi-function strength training machine designed for light-commercial use. This means it offers superior durability and quality. It also excels in micro-adjustability. Its core is similar to the Body-Solid G2B, but this unit is larger and integrates a fly press as well. The fly press arms are connected to the base frame, though, being completely separate from the main press. 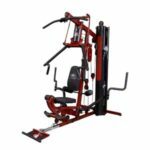 The Body-Solid G6BR gym system features a heavy-duty frame made of 2″ x 3″, 11-gauge steel tubing. All the steel parts are coated with corrosion-resistant and abrasion-resistance powder coat finish. 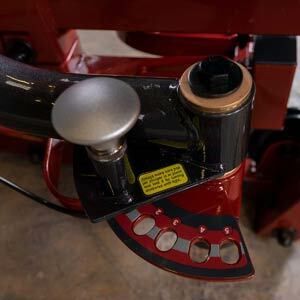 The main color used is red; there are several parts painted black, while the top logo plate and the cover of the front base bar have a chrome-plating finish. With the frame fully set up and the weight stack attached, the unit is considerably heavy. It weighs approx. 547 lbs (248 kg) which means it is not meant to be moved once it is assembled. But on the other hand, all this weight leads to superior stability. The unit won’t move or wobble even if you perform fast-moving exercises, using a heavy load. The machine does not have any adjustable stabilizers. Therefore, it’s recommended to assemble and use it on a rubber mat. A mat is not included with the unit. The fully assembled machine is fairly large. It is approx. 85″ (216 cm) long, and 50″ (127 cm) wide. Therefore, you should assign a usage area of at least 9′ x 6′ (275 x 183 cm) for it. Also, its height is approx. 84″ (213 cm) so it won’t fit in a room with a 7′ ceiling. The Body-Solid G6BR integrates multiple pulleys. They’re all 4 1/2″ in diameter; they’re made of fiberglass reinforced nylon material which is highly resistant to abrasion and wear. Each pulley is equipped with a precision-machined steel ball bearing in order to deliver a very smooth rotating motion. The machine’s cables are military spec, steel ropes with swivels at their ends to eliminate torsion, and for ease of use. They’re all rated for 2,200 lbs tensile strength and should support the 210 lbs weight provided by the machine’s stack with no problem. The unit’s seat and backrest feature high-density DuraFirm™ pads, integrating a generous layer of foam cushioning. Their upholstery is made of durable, double-stitched faux leather. Both the seat and the backrest are adjustable, offering several adjustment positions each. The seat has a telescopic, gas-assisted adjustment system which allows you to easily select the perfect height while you are already seated. An important aspect to mention here regards the arms of the machine’s presses. They are articulated which means they give you the possibility to perform flies or presses without any restrictions, adapting to your height and posture. Last but not least, this Body-Solid gym system includes several accessories. Among them, we can count the revolving lat bar, the revolving short bar, an ankle strap, an abs / triceps strap, a water bottle with holder, a towel holder, a full exercise chart for quick reference and a Total Body Workout DVD which covers the main exercises that can be performed on this machine. Front press. This workout station features two articulated arms with curved down grips. It has several adjustment positions and gives you the possibility to perform seated chest presses with a vertical or horizontal grip, and shoulder presses. Due to the bi-angular design, it replicates the free weight dumbbell press motion, eliminating the restriction of a regular press and producing up to 25% more muscle interaction. Fly press. As we’ve mentioned above, the G6BR has its fly press attached to its base, completely independent from the main press. Each arm is articulated, featuring several adjustment positions, and long grips to accommodate a wide range of users. It gives you the possibility to perform fly press exercises with vertical grips, simulating a dumbbell fly. High-pulley station. 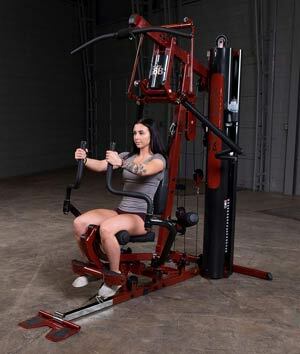 The machine features a standard, one-point high-pulley, and lat pulldown station. It offers the possibility to perform all the high pulley exercises. It includes a 48″ curved lat bar with a rubberized cover. Also, the machine features two knee stoppers with 4″ foam rollers which provide support when executing pulldowns with heavier loads. Mid-pulley station. 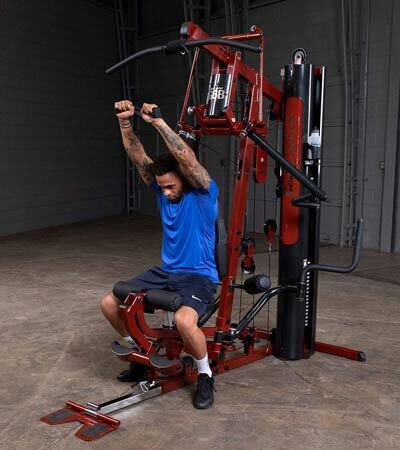 This workout station consists of a pulley integrated into the backbone of the machine. It allows you to perform various exercises, including ab crunches, mid rows, or triceps extensions. The ab crunch strap is included with the machine. Low-pulley station. The unit’s low-station makes available several exercises such as seated rows, bent-over rows, leg abductions, and more. A short bar with an extension chain is included with the machine and can be attached to the cable of the low pulley for the execution of these exercises. Leg developer. This attachment works in conjunction with the low pulley. It has a different design than the leg developers of other home gyms; it only has foam rollers (4″) at the top, while the lower cushions are curved providing better stability for the legs during extensions. Also, the leg developer CAM prevents resistance drop-off at the end of the extension motion which results in a more consistent resistance for the duration of the exercise. 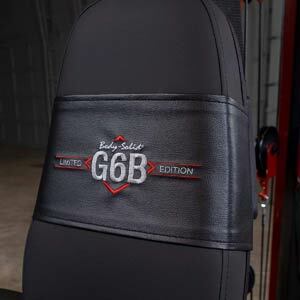 The Body-Solid G6BR features an all-metal, selectorized weight stack. The plates are made of heavy-duty cast iron and can take a lot of abuse before breaking. They are considerably superior to the vinyl/cement plates included with cheaper home gyms, such as the Gold’s Gym XR 55. The total weight of the included stack is 210 lbs (92.5 kg). 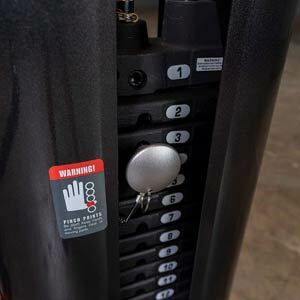 It integrates 20 weight plates 10 lbs (4.5 kg) each, plus the top stopper plate which also weighs 10 lbs. The plates glide on two durable rods with a chrome finish, providing a very smooth travel. They’re guarded from the bottom and all the way up by a metallic cover which also reduces some of the generated noise during exercises. The Body-Solid G6BR requires full assembly. It comes in several boxes and due to its total weight, it is recommended to be assembled by at least two people. The assembly task will take at least 4-5 hours, however, the manual provides pretty clear, step-by-step assembly instruction. Tools for assembly are not included. You will need a set of Allen wrenches, two adjustable wrenches, and a rubber mallet. Also, during the assembly, it is recommended to lubricate every pulley so that they will perform smoothly for a long period of time. Once the machine is assembled, maintenance doesn’t require much. The guide rods of the weight stack may require periodic lubrication. Other than this, it is recommended to periodically inspect the machine for loose bolts and parts. Lifetime warranty for home users. The Body-Solid G6RB is a light-commercial strength training system. It features 6 workout stations, a high-comfort adjustable seat, and a heavy-duty overall construction. It also includes several accessories, such as lat bar, short bar, ab crunch harness, ankle cuff, exercise DVD and chart, etc. It makes available more than 40 exercises for all muscle groups. In all, it’s a pretty complete home gym, offering excellent quality and versatility for the price.